The Cooperative Communications, Inc Voice Continuity Plan (VCP) will allow your company to remain in contact with your clients, customers, partners, and suppliers in the event that your traditional communications is compromised. What happens when your company’s voice communications are compromised? How much revenue would your organization lose if your voice connectivity was lost? How would customer service be impacted if your clients could not call you? Cooperative Communications, Inc is the first to market with a telephone back up solution that addresses these situations. In today’s day and age we need to be accessible and responsive at all times, an outage is no excuse. Traditionally, when your service is compromised, your customer will get a fast busy signal and will not be able to reach their intended party until the issue is repaired. 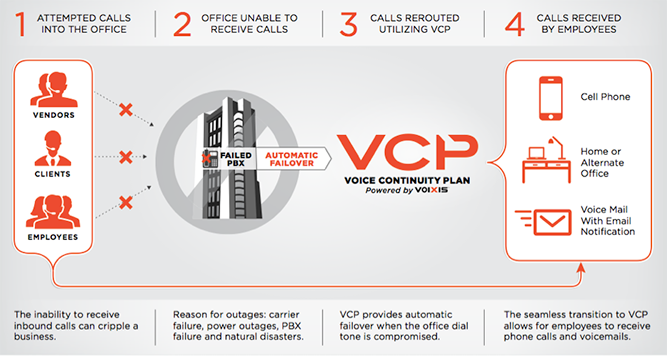 With VCP those lost calls would be re-routed to our cloud based system that will handle all your calls. Via your customized auto attendant, all your calls will be routed to the intended parties. Too often organizations find themselves hastily creating a disaster recovery plan. VCP helps you become proactive. This solution is extremely customizable, allowing you to create your predefined contingency plan. It becomes an internal decision when deciding how calls should be routed. Do you want every employee accessible via voice lines? Do you want to route your current extensions to individuals cell phones? Do you want some employees to solely receive voicemails via email? Do you want to route departmental calls to your POTS lines? Do you want to set up text message notification to let employees know of new voicemails? Are there employees that would want to route calls to their home office? Rather than leaving your clients wondering when your phone service will be restored, implement VCP, a solution that will keep your organization functioning at all times.